"Absolute Combo Pole / Hanging Birdfeeder" The Original Absolute Combo (Pole Hanger). The Best Squirrel Proof Feeder for Close to Home Bird Viewing! 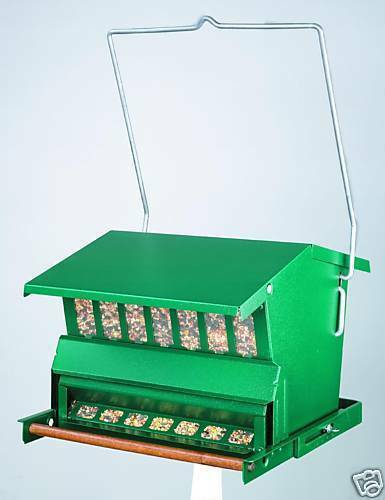 Adjustable weight setting to select birds to feed. Single-sided feeding for placement near windows or walls. Large 2.5 gallon/ 15 lbs. seed capacity. Hang or pole mount. (hanger pole included) Squirrel resistant construction. Adjustable weight settings. Seed saver baffle reduces wasted seed. East to open and fill with Top-Loc roof. Durable powder coated steel. Measures approximately 11.5" High x 13.5"W x 16"L. Weight 13 lbs.